Karim BENYEKHLEF, Jane BAILEY, Jacquelyn BURKELL and Fabien GÉLINAS, eAccess to Justice, Ottawa, University of Ottawa Press, 2016, 415 p.
Part I of this work focuses on the ways in which digitization projects can affect fundamental justice principles. It examines claims that technology will improve justice system efficiency and offers a model for evaluating e-justice systems that incorporates a broader range of justice system values. The emphasis is on the complicated relationship between privacy and transparency in making court records and decisions available online. Part II examines the implementation of technologies in the justice system and the challenges it comes with, focusing on four different technologies: online court information systems, e-filing, videoconferencing, and tablets for presentation and review of evidence by jurors. 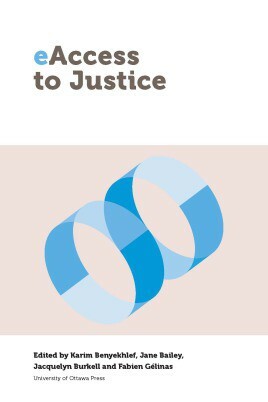 The authors share a measuring enthusiasm for technological advances in the courts, emphasizing that these technologies should be implemented with care to ensure the best possible outcome for access to a fair and effective justice system. Finally, Part III adopts the standpoints of sociology, political theory and legal theory to explore the complex web of values, norms, and practices that support our systems of justice, the reasons for their well-established resistance to change, and the avenues and prospects of eAccess. The chapters in this section provide a unique and valuable framework for thinking with the required sophistication about legal change. Ce contenu a été mis à jour le 6 décembre 2016 à 15 h 35 min.